The 5 most common places germs build up in your commercial kitchen. We live in a world of germs. There’s no way around it. There are ways to reduce the amount of infection-causing bacteria and microbes that lurk and thrive in the areas that affect us the most, however. 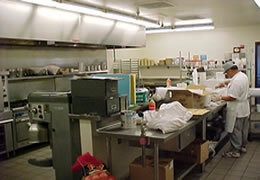 Tackling germ build up with the proper cleaning supplies in your commercial kitchen is the foundation of food safety. Food safety is of utmost concern in your commercial kitchen, so it’s important to know the most common places germs build up to prevent bacteria from causing safety concerns. Temperature plays a key role in bacteria build-up, with the “danger zone” between 40˚ and 140˚ Fahrenheit, where harmful bacteria multiply at the fastest rate. To grow, bacteria also require nutrients (nearly any type of food supplies the nutrients), moisture, and time (with bacteria able to increase 1,000-fold in just two hours). Kitchen appliances can be difficult to clean, and when not cleaned thoroughly components become breeding ground for bacteria and germs. When cleaning appliances, pay special attention to hard-to-reach areas, such as gaskets (like on blenders) and rubber seals. These surfaces are attractive to germs because they are porous, unlike non-porous stainless steel, which resists germs and bacteria more effectively. So, stainless steel appliances or those with mostly stainless steel parts are more germ and bacteria resistant than appliances with plastic or rubber components. Your commercial dishwasher is an excellent place to clean the rubber and plastic components of smaller commercial kitchen appliances such as food processors, blenders, and coffee makers (as long as the manufacturer’s recommendations indicate the components are dishwasher safe). With bigger kitchen appliances like refrigerators, plastic compartments (drawers for meat, produce, etc.) and seals (around the door) are the most likely to harbor germs. It’s important to pay special attention to these areas when cleaning, which may mean removing those components to give them a thorough wash. Before placing the components back in the large appliance, allow them to air dry, which eliminates bacteria’s needed moisture factor for growth. Again, tools which are porous, such as a rubber spatula, are more likely to harbor germs and bacteria than stainless steel tools. Don’t forget sink and floor drains when considering areas of bacteria and germ growth – also typically a porous surface through which many germs pass during each use. Traps under sinks are also a common place to find colonies of bacteria growing, and must be cleaned frequently. The film that builds up on drains, traps and garbage disposals is writhing with bacterial colonies. It must be cleaned very thoroughly with scrubbing and a strong chemical. Try scrubbing the drain or disposal with your cleaning solution and leaving it on until the next use, which will ensure bacteria do not regrow in the interim. You can clean traps using boiling water and bleach, and should do this every two weeks or so. Even food-grade safe plastic food storage containers often have rubber seals or other components, which are most vulnerable to bacteria and germ growth due to their porous nature. Clean these thoroughly and frequently to avoid buildup of germs and bacteria. Again, allow them to air dry after cleaning. Of course, food storage containers must be cleaned after every use with very hot water and a disinfecting chemical in order to kill bacteria. Sponges and cloths used to wipe counter surfaces are a big breeding ground for germs and bacteria. It’s important to wash and/or replace these items daily if not more often, and to always use very hot, soapy water when rinsing them. Experts recommend doing away with the use of sponges altogether in the commercial kitchen, and using a clean dishcloth on at least a daily basis. You can run scrubbers through your commercial dishwasher to disinfect each day. In considering cloths used for cleaning in your commercial kitchen, also consider replacing and cleaning your mop, as this is a cloth which comes into contact with a wide range of bacteria and germs while cleaning floors. It must be cleaned with strong chemicals in order to kill bacteria on a daily basis, and replaced often. Raw meats carry a host of harmful bacteria which are killed when it is cooked, but any surface it comes into contact with prior to that must be cleaned thoroughly to kill the bacteria. Among harmful bacteria present in raw meat is one of the most harmful, Escherichia coli 0157:H7, which can be fatal especially for children. In addition to meats prepared on a surface, other items are often set on surfaces which contain germs and bacteria, including boxes, bags, and other food preparation items. With cutting boards, it is smart to have one for preparation of meat products and another for fruits and vegetables. Clean the one used for meat with a bleach solution between each use, allowing it to air dry. Countertops can be cleaned using a spray-on bleach solution and then wiped dry to kill bacteria. As most commercial kitchens have stainless steel countertops which are more resistant to bacteria and germs, they may not be as likely to harbor colonies of germs. By being aware of the most common places germs breed in your commercial kitchen, you can prevent food-borne illness and encourage food safety. Previous Previous post: What is drilling detergent and how can it save your company money?